Today I'm happy to welcome Pi, the main character of Covert Youth Agency, to my blog for an interview! He'll be sharing some insight into CYA and himself. Guess what? He even brought an eBook along to give away! What a great guy! If you're interested in finding out more about this book, you can read my review, or check the end of this post for more links. 1) Hello Pi, and welcome to A Fanatic's Book Blog. First question, can you describe yourself for us in just one word? 2) The Covert Youth Agency is a really interesting project! What made you decide to start it in the first place? Two Noble Nerds were getting bullied in gym class. I wanted to help them, but without putting myself in the middle of their situation. So I had Lightman hack into the school billboard to announce our agency, and our mission. Sure enough, the Noble Nerds contacted the C.Y.A. through the secret channel we setup, and we were able alleviate their problem without exposing any of our identities. 3) I know that you get a lot of your inspiration from the FBI and CIA. What would you say is the most important thing you've learned studying their techniques? Always be wary of the power that you wield, you may be tempted to abuse it. 4) Do you have a plan to keep C.Y.A. going when you graduate? Will you pass it down to a new set of students? Graduation seems so far off. I imagine I'll want to be involved with something like the C.Y.A. in college, but I'm guessing there will be completely different challenges than the ones in high school. And therefore a different agency. Something more collegiate. If I can find candidates who are worthy, and who I trust to be true to the integrity of the organization, then yes, I would pass the C.Y.A. down to a new set of students. 5) It's easy to see how much you care about Vera. When did you know she was special to you? When I helped her with her junior high bug collection. I'm deathly afraid of bees, and yet there I was pretending not to be scared while netting one for her project. Never got stung by a bee that day, but I was stung by... well, I knew Vera had me in her net. And I still don't think she knows it. 6) Your nickname "Peter Pi", I know is one you only like your mom to use. If you could choose a nickname what would it be? I don't really like her calling me “Peter Pi,” but she's my mother, and she gets a kick out of saying it. Nicknames seem more akin to athletes, which clearly I am not. Cirrus would be a cool nickname. Cirrus clouds form at the highest altitudes and are often transparent. I like the idea of seeing everything from above, while being virtually unseen. 7) What are your hopes for the future? What job would you like to ultimately have? To run an organization dedicated to making the world a better, safer place. And to have a partner in Operation Life to share it with. What is the perfect job for me? I don't know if I could put up with the bureaucracy of working for the government. But I would be able to have the broadest impact if one of the agencies accepted me. Ideally, I'd like to be an independent, and run my own “show.” As to how I'd finance it, or the legalities of what I could do, that's something I need to figure out. Maybe in college. 8) Lastly I'm sure we'd all like a hint at what your next case might be! Any teasers you can give us? 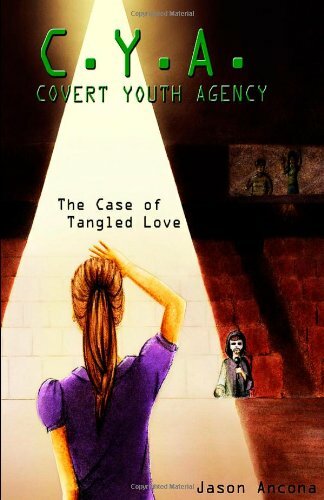 As I mentioned above, Pi was sweet enough to bring with him an eBook copy of Covert Youth Agency: The Case of Tangled Love to share! To enter, please leave your name and email address in the comment section! Giveaway will close one week from today, October 14th at 11:00 pm PST.